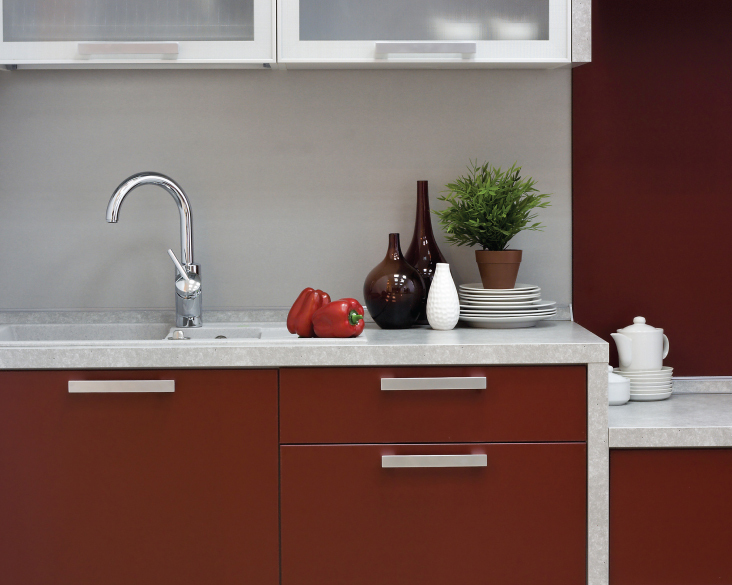 Choosing the correct countertop to fit your particular kitchen needs, and taste, is a major design decision. The options of color, texture and size are abundant and your choice will be a focal point of the room for years to come. It may seem relatively insignificant, but once that countertop selection is made, deciding on its edge style can be just as important. Don't rush through this step. Visual appeal is obviously the first factor considered in choosing a countertop edge design. Some people like the look of hard edges, others soft, still others a combination of both. Whatever your preference, it should enhance the appearance of the entire room. The most popular countertops sold today are either stone or laminate and both can have any of dozens of edging styles applied to them. Almost all these styles originate from one of a handful of basic cuts. Here is a review of some of them as well as other traits that should be kept in mind. Just as it sounds, this familiar look is common to both laminate and stone countertops and provides a simple 90-degree angle. With laminates, the vertical front edge meets the top edge leaving an exposed line. This crisp edge is considered an attractive accent by many, yet a distraction by others. One thing is certain; it is the most basic use of laminate. A straight edge on a stone countertop adds to its impressive, weighty appearance. The same effect can be had on a laminated countertop through a technique known as "mitering". The Miter Edge is made when one edge on an additional laminated piece is cut at a 45-degree angle and butted to an identical cut in the main counter's front. This approach gives the impression of a more imposing slab of stone, but at a minimal cost. Safety has to be considered when utilizing a straight edge design, since contact with it could cause more discomfort than with others. Due to this fact, many such edges are chiseled down in a process known as "easing". This softened, Eased Edge is more comfortable to touch and significantly reduces the possibility of the countertop being chipped should it suffer a blow from a heavy object. Clean-up is simple, but spills may tend to run off quickly. If we ease the countertop edge at a crisp 45-degree angle, we have the beveled edge. This style has been popular for a long time, and while still loved by many, it is beginning to be considered dated by some. None-the-less, the beveled edge on stone or stone-simulated laminate is a traditional look that stirs up feelings of classic architecture. Variations of the traditional beveled edge include trimming the bottom edge as well, or altering the angle of the bevel. One custom option for laminated counters is to use a contrasting strip of laminate on the beveled edge itself. This can create a stunning accent. Overall clean-up is easy with this design, but watch for spills to run right off that distinct edge. And, resting one's elbows on the bevel could quickly become uncomfortable. Taking the easing technique to the max results in the bold style known as bullnose. Considered timeless, this edge always seems to feel appropriate. The bullnose has both a convex rounded top and bottom creating a soft, inviting look. Like the straight edge, it compliments the massive appeal of both stone and simulated stone. Because it is totally rounded, the bullnose is perhaps the safest edge available. Cleanups are easy with no grooves to harbor dirt. Spills are a little less likely to reach the floor as fluids tend to adhere to the curved surface. And when it comes to comfort, its a hands-down victory for the bullnose since there are no ridges to irritate elbows. Any style of edge that curves downward like the bullnose is often referred to as a Waterfall Edge. The laminate or cut stone curves down from the top edge and falls toward the floor. This method of easing can take on endless forms from the full, to half, to double bullnose and more. When the traditional look is what you're after, you might want to consider the ogee cut. It is made by combining two arc grooves in opposite directions to create a subtle "s" profile. This is considered the edge to use when a touch of elegance is desired. It too can take on many transformations by adding deeper or additional grooves in either direction. The multiple ridges mean it takes a little more effort to keep clean, and although the lines are often softened, it may still get uncomfortable for arms to rest on them for any period of time. Marine - This edge is just what you think it is. A lip is raised along the perimeter of the counter much like is found on ship counters. The marine edge can be very attractive and is extremely practical, making it almost impossible for spills to hit the floor. DuPont - A spin-off of sorts from the ogee style. Instead of beginning with an arc at the top edge, the DuPont starts with a straight vertical cut before meeting a bullnose styled bottom. Like the ogee it adds an air of elegance to a room. Cove - A single concave arc, the opposite of a bullnose arc, is followed by a sharp vertical cut to the bottom in the cove edge. A simple, tasteful design. Chisel - For stone countertops this is the rustic look. The stone appears as if it were just chiseled from its natural surroundings, maintaining its rough-hewn edge. A very appealing tactile effect. By mixing and matching curves and hard angles almost any edge can be created for your kitchen countertop. If you stick with available stock cuts, you will save money. If you want to be creative, and cost is not a concern, consider a custom approach to make your kitchen countertop distinctive. Its the little things that can add zest to life; and in your kitchen that spark just might come from your choice of a countertop edge style. Download our free App Our App will help you see before you buy!